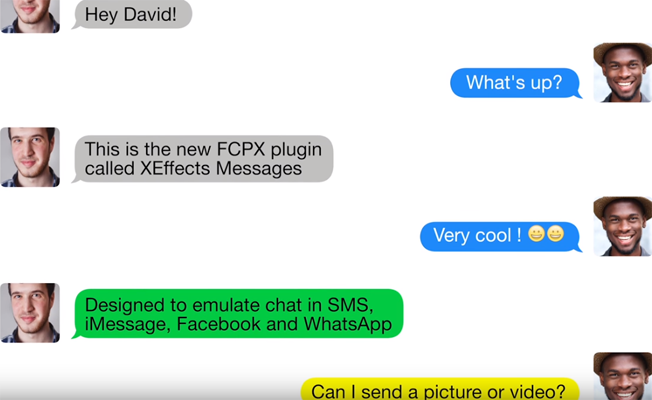 XEffects Messages enables FCPX editors to emulate SMS, iMessage, Facebook and WhatsApp text messages in video sequences. FxFactory (fxfactory.com) today announced the launch of XEffects Messages for Final Cut Pro X from Idustrial Revolution. XEffects Messages enables FCPX editors to emulate SMS, iMessage, Facebook and WhatsApp text messages in video sequences. All XEffects Messages elements animate automatically, creating a realistic on-screen text message conversation. Delivers sharp, high resolution results even in 4K timelines. To learn more about XEffects Messages, please visit http://www.idustrialrevolution.com/x8-messages, or watch this short video: https://www.youtube.com/watch?v=NoL6_-pKg80. XEffects Messages is available immediately for an introductory price of $49.00 USD (regularly priced at $99.00 USD). In partnership with Idustrial Revolution, FxFactory will provide all sales and customer support for XEffects Messages. To purchase, please visit https://fxfactory.com/info/xeffectsmessages/.